The Transiting Exoplanet Survey Satellite is a rather impressive mission! Only approved in 2013, in just 5 years the team from MIT have built an astounding little satellite. I won’t talk about it’s funky lunar-resonant orbit, about its internal hardware, or even about it’s launch on a Space X Falcon 9. Instead I’m going to talk Science. What will it find? Why is that important? TESS has four cameras, each around 10cm in diameter. These will scan tens of thousands of stars hunting for the blip in light as a planet transits across its star, just like NASA’s Kepler mission did before it. However, TESS’s cameras are about 10x smaller than Kepler and that means TESS will collect around 100x fewer photons. And, given photons are built up over time, consider also that TESS will stare at most stars for only a month where Kepler looked at its field for 36! In both these cases, TESS will capture far less light from the stars it studies, and therefore far more noise. For any given Kepler planet, TESS will see between 20 and 60 times less signal, making easily-spotted giant planets & neptunes disappear into the noise of the TESS data. However, all is not lost. TESS searches an area around 5.5% of the sky in one pointing (20x more than Kepler) and will eventually cover 60% after its 2 year mission (100x more than Kepler!). That wide field also means that TESS can focus on closer and brighter stars. In fact the average TESS planet host will be about 3 magnitudes brighter than a Kepler planet. Some of them will even be naked-eye visible! That’s a factor of 16 in photons, which helps claws back some of the losses from its reduced size. Those brighter stars also suddenly mean that following up targets from the ground (either to hunt for more transits, or to measure a planet’s mass with RVs) is so much easier! So this strategy should pay off, in terms of the sheer number of planets (which should dwarf Kepler), and in terms of the number of those planets which will be characterisable afterwards. So what will it spot? Well, planets. A lot of them. The Sullivan et al yield paper (which has recently been updated by Barclay et al) showed that, from the 200,000 stars it will study in detail, we can expect nearly 2000 planets. But in the 2 million or so bright stars that are also observed (in the full-frame images it sends back), that increases to a whopping 25 thousand! They includes something like 17,000 hot Jupiter candidates, meaning TESS will detect almost every single transiting hot Jupiter within a few hundred lightyears (and help put out-of-business the ground-based observatories like WASP, KELT, HAT, etc). 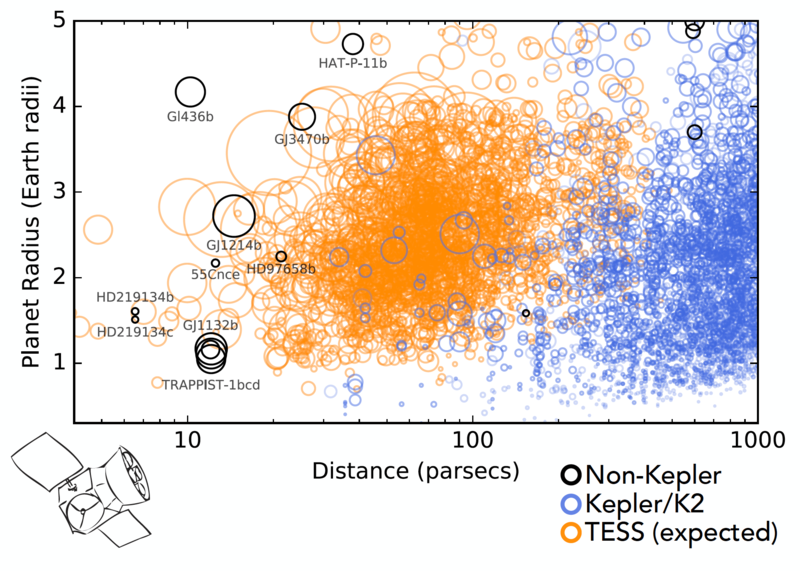 TESS’s planet haul will also include a few thousand Neptunes & Super-Earths, and a few dozen Earth-size planets (~50). These small planets, unlike Kepler, will mostly be around small stars. That means, if your personal definition of “earthlike planet” requires a sunlike star (and maybe it should), than TESS is incapable of finding any Earthlike planets. It will find a handful of ~1Re planets with similar surface temperatures to Earth around M-dwarfs, however. I’ll finish off with some personal thoughts. I have to admit, I was a big sceptic of TESS until a couple of months ago! I thought its tiny cameras would only find M-dwarf planets & hot jupiters. However, having run my own yield simulations, I realise I was wrong! TESS is more than capable of finding interesting small planets around stars larger than M-dwarfs! For example, it should find hundreds of 1.5-4Re short-period planets around bright K and G-stars in the full frame images. Far brighter stars than for Kepler! The mass-radius plot after TESS is going to be far better filled-in than it is now! Despite the fact it will find lots of interesting rocks planets, the recent news articles calling TESS a “habitable planet hunter” are simply bad science journalism (although something we’ve come to expect from the NASA press-release hype-machine). The coolest thing about TESS is not that it will find a few flare-scorched M-dwarf worlds, but instead that it will find so many other new exoplanets, from super-Earths to hot Jupiters. Those sheer numbers will allow statistical samples of well-characterised planets in ways we’ve never even previously considered. Something I think we should not expect from TESS, however, is huge bulk announcements of “validated” TESS planets. 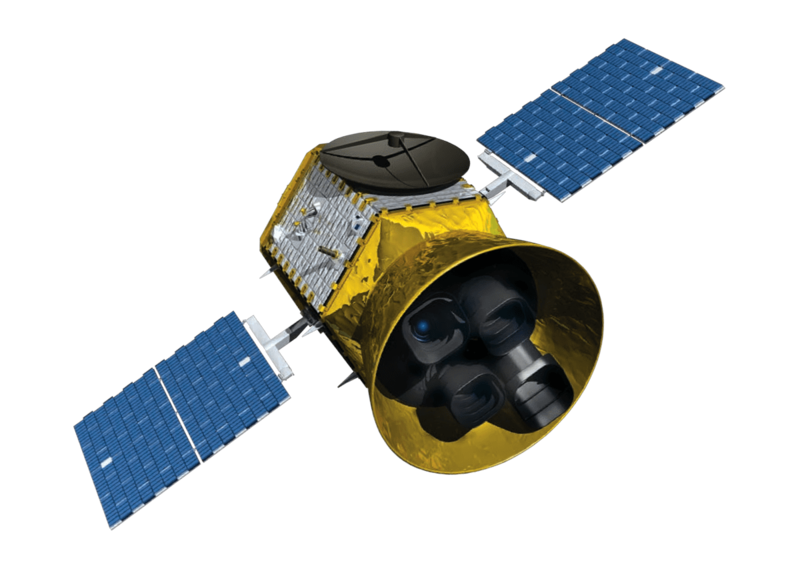 TESS’s wide field means it has enormous pixels compared to Kepler. That means there is far higher chance that there’s another star (such as a binary) hiding within the pixels, something Kepler did not have to worry about so much. That might mean that many more of TESS’s candidate planets remain candidates (my guess), or maybe that, thanks to our ability to follow-up these candidates from the ground, we get far more planets and far more information on those planets than we did with Kepler. Only time will tell! All that remains is to say good luck to TESS on its SpaceX launch & it’s journey out to its resonant orbit (via the moon)! On a side/personal note – what was supposed to be a “birthday present” for me (launching on 16th April) is now more of a “memorial” to my grandmother Alice, who passed away on the afternoon of the launch (18th April 2018) at the age of 97. RIP.